In this Philippine name, the middle name or maternal family name is Alonzo and the surname or paternal family name is Wurtzbach. Pia Angela Alonzo Wurtzbach  (Tagalog: [wuɾtsˈbak]; German: [ˈvʊʁtsbax]; born September 24, 1989), formerly known in the Philippine entertainment and modeling industry as Pia Romero, is a Filipina-German beauty pageant titleholder, model and actress who was crowned Miss Universe 2015 on December 20, 2015. She won the third Miss Universe crown for the Philippines at the Binibining Pilipinas 2015 pageant on March 15, 2015. She has served as a UNAIDS Goodwill Ambassador for Asia & the Pacific since 2016. Wurtzbach was born in Stuttgart, Germany to a German father and Filipino mother. Her middle name "Alonzo" is her mother's maiden name, as per the naming practice in the Philippines. The family would settle, however, in Iligan in the Philippines and would later move to Cagayan de Oro in the country's Northern Mindanao region where she attended kindergarten at Kong Hua School and primary school at Corpus Christi School. Her parents separated when she was 9 years old and she became the family's main breadwinner by doing modeling and acting. After being raised in the Philippines, she spent several years in England. She finished her secondary education at ABS-CBN Distance Learning Center in Quezon City, Metro Manila and studied culinary arts at the Center for Asian Culinary Studies in San Juan, Metro Manila. Wurtzbach speaks fluent Cebuano, English and Filipino. She also speaks basic German, which she described as "enough to get myself a bratwurst". Wurtzbach is a professional model, actress, host and TV personality. She began acting at age four under the stage name Pia Romero. Managed by ABS-CBN Corporation's talent agency, Star Magic, she was included on the Star Circle Batch 11. Among her TV credits are the teen-oriented series K2BU, the concert variety program ASAP, the romance anthology Your Song, the sitcom show Bora, and the drama series Sa Piling Mo. She appeared in films such as Kung Ako Na Lang Sana (2003), All My Life (2004), and All About Love (2006). She went on to become a stylist, makeup artist and beauty writer for Philippine Daily Inquirer's 2bU section. She then had to temporary quit showbiz in order to focus on the Miss Universe Pageant. In Oct 2017, she returned to ABS-CBN which marked her comeback to showbiz. Pia Wurtzbach during Binibining Pilipinas 2015. I think that we should be careful about what we post online especially our thoughts and our opinions, that we don’t hurt anybody especially selfies, we have to be careful with what we post especially in our bodies, in our faces. So always think before you click. I think that the United States and the Philippines have always had a good relationship with each other. We were colonized by the Americans and we have their culture in our traditions even up to this day and I think that we're very welcoming with the Americans and I don't see any problem with that at all. To be a Miss Universe is both an honor and responsibility. If I were to be Miss Universe, I will use my voice to influence the youth, and I would raise awareness to certain causes like HIV awareness that is timely and relevant to my country which is the Philippines. I want to show the world, the universe rather, that I am confidently beautiful with a heart. Thank you. A set of commemorative stamps issued by the Philippine Post Office honoring the three Miss Universes of the Philippines. Wurtzbach's answer references the pageant's motto "Confidently Beautiful". At the end of the show, host Steve Harvey mistakenly announced Miss Colombia Ariadna Gutiérrez as the winner. However, after Gutiérrez's crowning, Harvey returned to the stage and stated that he had misread the results and that Wurtzbach was really Miss Universe 2015. Paulina Vega (Miss Universe 2014) then removed the crown from Gutiérrez's head and placed it on Wurtzbach's head. Wurtzbach is the third Miss Universe from the Philippines after Gloria Diaz in 1969, and Margarita Moran in 1973. On January 21, 2016, she traveled to Bali, Indonesia to shoot a commercial for C 1000, a vitamin brand available in Indonesia. Two days later, on January 23, 2016, she arrived in the Philippines for a week-long homecoming celebration with visits to the cities of Manila, Makati, Pasay and Quezon City. She also made courtesy calls to the Congress of the Philippines, Senate of the Philippines and Malacañang Palace. On February 1, 2016, she arrived in San Francisco to fulfill her duties as Inside Edition's special correspondent for Super Bowl 50. While in San Francisco, she was also reunited with Janine Tugonon, Miss Universe 2012 1st Runner-up from the Philippines. On February 28, 2016, she travelled to Toronto, Canada to deliver a speech against bullying at the Speakers Forum for the International Students of the Language Academy of Canada wherein she shared some of her childhood experiences as a victim of bullying. During her stay in Canada, she was reunited with Miss Universe Canada 2015, Paola Nunez Valdez. She also met and gave some advice to the contestants of Miss Universe Canada 2016. On March 25, 2016, Wurtzbach returned to the Philippines for an unannounced visit to take care of some personal things including renewing her Philippine passport, charity works and film a new commercial for Philippine Airlines. She also met and gave advice to the candidates of Binibining Pilipinas 2016 during their press presentation. On April 12, 2016 she returned to the Philippines for the Binibining Pilipinas 2016 pageant and on April 17 crowned her successor Maxine Medina as Miss Universe Philippines 2016 during the coronation night. During the pageant she was reunited with Miss Myanmar 2015, May Barani Thaw and Miss Malaysia 2015, Vanessa Tevi while Miss USA 2015, who at Miss Universe, placed 2nd runner-up, Olivia Jordan served as a judge. Wurtzbach's farewell speech and walk at Binibining Pilipinas 2016 as Miss Universe Philippines 2015, trended at social media with enormous hits. On April 21, 2016, Wurtzbach arrived in Peru to attend Miss Peru 2016 pageant where she served as a judge. She also had a press conference a day before the pageant and was greeted by the Lima City Mayor, Luis Castaneda and received an honor of being "The Distinguished Guest of Lima". Wurtzbach along with Miss Peru 2015, Laura Spoya crowned Valeria Piazza, Miss Peru 2016. On April 27, 2016, Wurtzbach threw out the ceremonial first pitch for the New York Mets. A month later on May 27, 2016, Wurtzbach travelled to Machala, Ecuador to help the victims of the recent earthquake that killed the lives of at least 600 people. She was welcomed by the mayor of Machala, Carlos Falquez Batallas to the city and was named as an honorary volunteer of the Guayas Red Cross wherein she was invited to participate in the global appeal of raise resources to build 6,000 homes for the earthquake victims. She was also given a chance to meet Connie Jiménez, Miss Ecuador 2016 during her visit. In June 2016, Wurtzbach represented the Philippines and the Miss Universe Organization in a high-level meeting of the United Nations that aimed at ending AIDS. In her capacity as Miss Universe, Wurtzbach visited Indonesia, Canada, Peru, Ecuador, the Cayman Islands, Thailand, Panama, the United Arab Emirates, Singapore, several cities across the United States and her native country, the Philippines. As a parting gift on her final official photoshoot, Wurtzbach was granted access to the elusive Mikimoto Crown. Wurtzbach relinquished her Miss Universe crown and passed it on to Iris Mittenaere of France at the 65th Miss Universe pageant, held on January 29, 2017 in Manila, Philippines. On January 29, 2017, Wurtzbach revealed that she has signed a contract with WME/IMG's IMG Universe division where she will continue to work with the Miss Universe Organization as an HIV/AIDS awareness advocate after her reign. It was also revealed that she will appear on the fifth cycle of Asia's Next Top Model as a guest judge on several episodes. She costarred with Vice Ganda and Daniel Padilla in a film under production of Star Cinema. The project served as her acting comeback after six years and her first film in more than a decade. The film entitled Gandarrapido: The Revenger Squad served as one of the eight official film entries in the 2017 Metro Manila Film Festival. Wurtzbach served as a judge during the final coronation night of Miss Universe 2017. She starred in another Star Cinema movie entitled My Perfect You alongside Gerald Anderson. 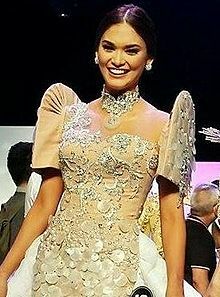 Although a practising Roman Catholic and Marian devotee, Wurtzbach has openly supported views that are at variance with Catholic Church teaching, particularly the distribution of birth control via full implementation of the Philippines' Reproductive Health Law, and recognition of LGBT rights in the Philippines. On Instagram she declared her support for the LGBT community in light of the Orlando nightclub shooting in 2016. On December 13, 2016, Wurtzbach met with Manila Archbishop Luis Tagle for Caritas Internationalis at the Manila Cathedral in Intramuros and received a personal rosary from Pope Francis. Wurtzbach is an advocate for gender equality. In 2018, she called on the Philippine Senate to pass the SOGIE Equality Bill. In 2017, Wurtzbach was named a UNAIDS Goodwill Ambassador for Asia and the Pacific. Wurtzbach has tweeted that she intends to remain unmarried and childfree. As of 2017, she is in a relationship with Filipino-Swiss race-car driver Marlon Stöckinger. The two started dating by October 2016. Wurtzbach among the New York Mets in April 2016. 2011 Maalaala Mo Kaya Elaine Episode: "Stroller"
^ Beltran, Llhonette (December 24, 2015). "13 photos from Pia Wurtzbach's childhood and teenage years". Philippines: Philippine Entertainment Portal. Archived from the original on January 18, 2016. Retrieved January 13, 2016. ^ "Pia Wurtzbach - Pageant Planet". www.pageantplanet.com. Retrieved January 8, 2019. ^ Marzon, April Argen Pat B. (March 23, 2015). "Bb. Pilipinas Pia Alonzo Wurtzbach: Cdeo is my second home". Sun.Star. Philippines. Archived from the original on December 25, 2015. Retrieved January 18, 2016. ^ Ax, Joseph; Bailey, David (December 21, 2015). "Miss Universe host announces wrong winner before Miss Philippines crowned". Reuters. United Kingdom. Retrieved December 23, 2015. ^ Argen, April; Marzon, Pat B. (March 23, 2015). "Bb. Pilipinas Pia Alonzo Wurtzbach: Cdeo is my second home". Sun.Star. Retrieved February 9, 2017. ^ a b Fisher, Luchina (December 22, 2015). "5 Things to Know About Miss Universe Winner Pia Alonzo Wurtzbach". ABC News. Retrieved December 25, 2015. ^ a b c d Sabillo, Kristine Angeli (March 31, 2014). "Did Angara ruin Pia Wurtzbach's chances at Bb. Pilipinas?". Philippine Daily Inquirer. Retrieved January 13, 2016. ^ a b San Juan, Luis Carlo (March 18, 2015). "Bb. Pilipinas Universe is Inquirer Lifestyle's own, a best friend". Philippine Daily Inquirer. ^ Siazon, Rachelle (April 14, 2013). "Pia Wurtzbach: Bb. Pilipinas #15 Profile, Bios, & Photos". Philippine Entertainment Portal. ^ Macatee, Rebecca (December 21, 2015). "Miss Universe 2015 Pia Alonzo Wurtzbach: 5 Things to Know About Miss Philippines". E!. Retrieved January 13, 2016. ^ Duan, Noël (January 19, 2016). "Why Miss Universe Pia Alonzo Wurtzbach Doesn't Have Time for Drama". Yahoo!. Retrieved January 21, 2016. ^ a b c d "#thenandnow: From Pia Romero to Pia Wurtzbach". ABS-CBN Corporation. Retrieved February 9, 2017. ^ Umbao, Ed (February 27, 2013). "Bb. Pilipinas 2013 Five Celebrity Candidates Profile Bios". Philippine News. Retrieved February 9, 2017. ^ a b "From an aspiring teen star to a 'beauty queen' – Pia Wurtzbach. Who is she?". Star Cinema. April 4, 2014. ^ Dumaual, Miguel (February 23, 2013). "Meet 5 celebrity beauties in 2013 Binibining Pilipinas". ABS-CBN Corporation. ^ Sallan, Edwin P. (March 16, 2015). "Pia Wurtzbach bags Miss Universe PH crown, leads Bb. Pilipinas winners". News5. ^ San Juan, Thelma Sioson (March 16, 2015). "Congratulations, Pia! Inquirer Lifestyle's 2bU stylist is Binibining Pilipinas-Universe 2015". Philippine Daily Inquirer. ^ Villanueva, Michael Josh (April 15, 2013). "Binibining Pilipinas 2013 winners crowned". Rappler. Retrieved January 13, 2016. ^ "FULL LIST: Winners at the Bb Pilipinas 2014 coronation night". Rappler. March 31, 2014. Retrieved January 13, 2016. ^ "Wurtzbach finally bags crown, to vie for Miss Universe". ABS-CBN News. March 16, 2015. Retrieved December 21, 2015. ^ Mariejo Ramos (March 17, 2015). "The Binibining Pilipinas 2015 Q&A portion". Philippine Daily Inquirer. Retrieved September 14, 2017. ^ a b "Q&A: Pia Wurtzbach on US presence, being Miss Universe". The Philippine Star. December 21, 2015. Retrieved April 2, 2016. ^ Lovece, Frank (December 21, 2015). "Miss Universe 2015 Pageant mistakenly crowns miss Colombia the winner". Newsday. New York City. Retrieved December 22, 2015. ^ "Miss Universe 2015 Final Results, Winners, Live Coverage and Updates". Zeibiz. December 20, 2015. Retrieved February 9, 2017. ^ Macatee, Rebecca (December 21, 2015). "Miss Universe 2015 Pia Alonzo Wurtzbach: 5 Things to Know About Miss Philippines". E! News. Retrieved December 22, 2015. ^ "FOTO: Miss Universe 2015 Pia Wurtzbach di Bali". Indonesia: Rappler. January 22, 2016. Retrieved February 9, 2017. ^ Tantuco, Vernise L. (January 23, 2016). "Miss Universe Pia Wurtzbach arrives in Manila". Rappler. ^ Tan, Lara (January 25, 2016). "LOOK: Pia Wurtzbach's homecoming schedule". CNN Philippines. Retrieved April 2, 2016. ^ Alpad, Christina (February 3, 2016). "Miss U Pia Wurtzbach stirs up Super Bowl". The Manila Times. Retrieved April 2, 2016. ^ "LOOK: Pia Wurtzbach starts job as special correspondent for Super Bowl". Rappler. February 2, 2016. Retrieved April 2, 2016. ^ "WATCH: Pia Wurtzbach takes tour of San Francisco". The Philippine Star. February 9, 2016. Retrieved April 2, 2016. ^ Warmington, Joe (February 28, 2016). "Miss Universe spreads her message in T.O." Toronto Sun. Retrieved April 6, 2016. ^ Cruz, Rachelle (March 2, 2016). "Pia Wurtzbach: 'I experience bullyig in different forms'". ABS-CBN Corporation. Retrieved April 6, 2016. ^ "Pia's advice to Miss U Canada candidates: Be nice to everyone". Philippine Daily Inquirer. March 2, 2016. Retrieved April 6, 2016. ^ "Miss Universe Pia Wurtzbach visits Canada". GMA News. March 2, 2016. Retrieved April 6, 2016. ^ "Pia Wurtzbach arrives in Manila unannounced". ABS-CBN Corporation. March 25, 2016. Retrieved April 6, 2016. ^ Soriano, Gia Allana (March 26, 2016). "Pia Wurtzbach visits children from international charity". GMA Network. Retrieved April 6, 2016. ^ "Pia Wurtzbach and the #HeartoftheFilipino in new TV ad". GMA Network. April 9, 2016. Retrieved April 10, 2016. ^ Ortiguerro, Romsanne (March 30, 2016). "'Enjoy the moment': Pia Wurtzbach's 'confidently beautiful' advice to Bb. Pilipinas 2016 candidates". News5. Retrieved April 6, 2016. ^ "Here's why Pia returned to PH on Good Friday". ABS-CBN Corporation. March 29, 2016. Retrieved April 6, 2016. ^ "Pia has advice for Bb. Pilipinas 2016 candidates". ABS-CBN Corporation. March 30, 2016. Retrieved April 6, 2016. ^ Caole Vila, Alixandra (April 13, 2016). "Pia Wurtzbach arrives in Manila for Bb. Pilipinas 2016". The Philippine Star. Retrieved April 18, 2016. ^ "Maxine Medina crowned Miss Universe Philippines 2016". Rappler. April 17, 2016. Retrieved April 18, 2016. ^ "'Besties' unite: Miss USA, Malaysia and Myanmar arrive in Manila". ABS-CBN Corporation. April 16, 2016. Retrieved April 18, 2016. ^ Mishra, Vagisha. "The Historic Farewell of Queen P!". The Kaleidoscope of Pageantry. Retrieved April 18, 2016. ^ "Pia Wurtzbach goes to Peru, marks 1st time in Latin America". Philippine Daily Inquirer. April 22, 2016. Retrieved May 9, 2016. ^ "Pia Wurtzbach asks final question in Miss Peru pageant". GMA Network. April 24, 2016. Retrieved May 9, 2016. ^ "Pia Wurtzbach's first trip to Latin America". GMA Network. April 23, 2016. Retrieved May 9, 2016. ^ "Pia crowns 2016 Miss Peru–Universe". The Philippine Star. April 27, 2016. Retrieved May 9, 2016. ^ "Pia Wurtzbach throws first pitch at New York Mets game". Rappler. April 28, 2016. Retrieved May 9, 2016. ^ "Pia Wurtzbach goes to Ecuador to help earthquake victims". GMA News and Public Affairs. May 30, 2016. Retrieved May 30, 2016. ^ "Pia Wurtzbach in Ecuador to help quake victims". ABS-CBN Corporation. May 28, 2016. Retrieved May 30, 2016. ^ "Pia Wurtzbach's next stop: Ecuador". ABS-CBN Corporation. May 28, 2016. Retrieved May 30, 2016. ^ "LOOK: Pia with Miss Ecuador 2016". ABS-CBN Corporation. May 30, 2016. Retrieved May 30, 2016. ^ "LOOK: Pia Wurtzbach represents PH in UN meeting". ABS-CBN Corporation. June 9, 2016. Retrieved June 19, 2016. ^ "Pia Wurtzbach represents the Philippines in United Nations meeting". GMA News and Public Affairs. June 9, 2016. Retrieved June 19, 2016. ^ "WATCH: Pia Wurtzbach featured in a commercial in Indonesia". GMA Network. Retrieved November 23, 2016. ^ "Miss Universe Pia Wurtzbach visits Canada". GMA Network. Retrieved November 23, 2016. ^ "Pia Wurtzbach applauds 'plus-sized' Miss Peru candidate". GMA Network. Retrieved November 23, 2016. ^ "Pia Wurtzbach goes to Ecuador to help earthquake victims". GMA Network. Retrieved November 23, 2016. ^ "WATCH: Pia swims with stingrays in Cayman Islands". ABS-CBN News. Retrieved November 23, 2016. ^ "Pia Wurtzbach goes on an 'unexpected trip' to Thailand". ABS-CBN News. Retrieved November 23, 2016. ^ "LOOK: Pia Wurtzbach visits Panama". ABS-CBN News. Retrieved November 23, 2016. ^ "LOOK: Pia Wurtzbach in Dubai". ABS-CBN News. Retrieved November 23, 2016. ^ "WATCH: Pia Wurtzbach's emotional speech at Bb Pilipinas 2016 coronation". Rappler. Retrieved November 23, 2016. ^ "France's Iris Mittenaere wins Miss Universe 2016". Rappler. January 30, 2017. Retrieved May 10, 2017. ^ "Pia Wurtzbach signs contract with IMG". ABS-CBNnews.com. January 30, 2017. Retrieved May 10, 2017. ^ "Pia Wurtzbach to appear as judge on Asia's Next Top Model". GMA News and Public Affairs. February 27, 2017. Retrieved May 10, 2017. ^ "Vice Ganda, Pia Wurtzbach to co-star in movie". ABS-CBNnews.com. May 5, 2017. Retrieved May 10, 2017. ^ a b "MMFF announces first 4 official entries for 2017 festival". Rappler. June 30, 2017. Retrieved November 17, 2017. ^ "Pia Wurtzbach is one of the judges of Miss Universe 2017". ABS-CBNnews.com. November 16, 2017. Retrieved November 17, 2017. ^ "Pia Wurtzbach to co-star with Gerald Anderson". Manila Bulletin. February 9, 2018. Retrieved March 5, 2018. ^ "Pia Wurtzbach confirms relationship with Marlon Stockinger". ABS-CBN Corporation. January 16, 2017. Retrieved January 16, 2017. 'I’m also happy with the fact that [Marlon Stöckinger]'s a Filipino and that he’s also a Catholic. I think we have a lot of things in common', Wurtzbach said. ^ a b Aurelio, Julie M. (December 10, 2016). "His Eminence to meet Miss U Pia Wurtzbach". Philippine Daily Inquirer. Retrieved February 9, 2017. ^ Legaspi, C. Mendez (May 3, 2017). "Pia Wurtzbach's dream to become AIDS advocate comes true". The Philippine Star. Retrieved May 3, 2017. ^ Tantiangco, Aya (January 5, 2017). "Pia Wurtzbach dismisses rumors she's looking to settle down after Miss U reign". GMA Network. Retrieved January 5, 2017. ^ "Pia Wurtzbach confirms relationship with Marlon Stockinger". ABS-CBN Corporation. January 16, 2017. Retrieved January 16, 2017. ^ "Pia Wurtzbach joins 'ASAP' family". ABS-CBNnews.com. October 8, 2017. Retrieved November 17, 2017. ^ Belmonte, Maureen Marie (January 31, 2016). "EXCLUSIVE: Former 'K2BU' star Angelene Aguilar recalls fond memories with Pia Wurtzbach". ABS-CBN Corporation. Retrieved May 9, 2016. ^ a b c d e f Anarcon, James Patrick (January 26, 2017). "Did you know Pia Wurtzbach once played a jellyfish for TV series?". Philippine Entertainment Portal. ^ "Manok (Dabiana)". Maalaala Mo Kaya. April 14, 2005 . ABS-CBN. ^ "Stroller (Foster a Child)". Maalaala Mo Kaya. December 28, 2013 . ABS-CBN. ^ "Coney Reyes and Andrea Brillantes Tackle Adoptions in Maalaala Mo Kaya". Philippine Entertainment Portal. December 25, 2013. Retrieved July 26, 2016. ^ "Birth Certificate (Ampon)". Maalaala Mo Kaya. Retrieved July 26, 2016. ^ "Iza Stars in New 'MMK' Episode". ABS-CBN News. September 13, 2012. Retrieved July 26, 2016. ^ "Pia Wurtzbach to appear on 'Asia's Next Top Model' cycle 5 - Rappler". Rappler. January 10, 2017. Retrieved November 17, 2017. ^ "Liza Soberano to play Pia Wurtzbach on 'MMK'". ABS-CBNnews.com. May 23, 2017. Retrieved November 17, 2017. ^ "WATCH: Pia Wurtzbach joins 'It's Showtime'". ABS-CBNnews.com. September 27, 2017. Retrieved November 17, 2017. ^ Iglesias, Iza (July 28, 2017). "Pia Wurtzbach prepares to act anew". The Manila Times. TMT. Retrieved September 4, 2017. ^ "WATCH: These movies won big at the 34th PMPC Star Awards for Movies". Rappler. February 20, 2018. Wikimedia Commons has media related to Pia Wurtzbach.